BALTHAZAR RESTAURANT, A FRENCH BISTRO ON SPRING STREET IN THE SOHO SECTION OF MANHATTAN, buzzes at 11 o’clock on a Thursday morning as waiters in white aprons serve espresso, a sprinkling of tourists speak Italian and French, and young men and women in retro sneakers talk about digital media. The building, which was originally a leather wholesaler’s warehouse, is a watering hole for new media pioneers who meet with advertising clients, media partners, content providers, and reporters. It is the epicenter of the revolution that threatens to turn traditional media into roadkill. Dina Kaplan ’93, co–founder of the Web startup blip.tv, gesticulates madly as she speaks to another woman seated across from her. A former White House aide, MTV news producer, and television reporter, Kaplan is just back from Tianjin, China, where she attended the World Economic Forum. She hasn’t stopped moving since her flight landed a few hours ago. She’s been to the gym for running and then yoga, had her hair cut and colored, and is now on her third breakfast meeting. A petite woman with brown hair, wearing a sparkling necklace and cotton pinstriped jacket, Kaplan smiles broadly. She has good reason. She is meeting with a striking young woman with straight blond hair who stretches over her egg–white omelet to point at the Apple laptop on the table between them. Sarah Austin looks like a model, but she’s flipping PowerPoint slides and talking about marketing strategy. Austin is a celebrity in the new world of Web shows. The New York Times, calling her a central figure in the emerging subculture of New York techie nightlife, wrote about her as “the founder of Pop17, a Web site posting her video interviews with tech–world celebrities.” Pop17 is Entertainment Tonight for geeks. Austin is much more than the cue card reader. She is the star, producer, editor, and ad salesperson of her own show. Each Monday and Thursday nights, thousands of fans watch her show, sponsored by Virgin Atlantic. The discussion on the table is how Pop17 could work with blip.tv. Kaplan and four partners started blip.tv in May of 2005, on the belief that shows for the Web would become increasingly important and creators would need someone to host, package, and sell their shows. In 2007, blip received funding from the creators of the Internet phone service, Skype. As Austin and Kaplan sit together in Balthazar plotting strategy and outlining a potential deal, one of Kaplan’s partners simultaneously is trying to close a large investment from Bain Capital. Though blip.tv is still in its infancy, Kaplan and her partners have been more right about the evolution of the video industry than they ever could have imagined. Last year’s Hollywood writers’ strike, which highlighted the rapidly increasing role of the Web as a platform for television content, accelerated the pace of change. Since then, content for Web shows has been exploding. Web shows still tend to be shorter than regular television—three to five minutes long—but the quality and variety of programming has increased exponentially. Blip now has 38,000 actively updated shows on its network, ranging from on–the–ground reporting in Baghdad to vivid images of wildlife in Africa to political cartoons to highly produced dramas. When Michael Moore released his most recent movie, Slacker Uprising, he did it on blip.tv. On the day Kaplan met with Sarah Austin, blip counted two million “views” of its shows. The Internet, unlike broadcast television, allows blip to count with great precision how many people are watching. Kaplan expects to have 150 million monthly views once she unveils several new distribution deals early in 2009. Blip’s economic proposition is simple: creators provide their shows and blip uses economies of scale to do all the back–end work and sell the advertisements that roll before, during, or after the shows. The shows’ creators and blip share revenue 50:50. Unlike movies or television of prior generations, show creation for the Web is purely democratic. “Our goal is nothing less than creating the first merit–based video network ever,” Kaplan says. On blip.tv there is no gatekeeper and there are no barriers to entry. Hollywood does not dream up hits; people anywhere create them and hope they will catch fire by word–of–mouth. Blip can sell those that gain a following to advertisers. It’s like American Idol without Simon Cowell. We all get to vote. This revolutionary fact inspires Kaplan to be passionate about the cause. “There’s nothing I like more than calling up independent show creators to tell them I’m going to be mailing them a check because we just sold a sponsorship for their show,” she says. Rogers warns, “The ad–skipping market dynamics are setting up what I think will be an enormous crisis for the media industry in terms of how it is financially supported.” Like the music and newspaper industries just before their spectacular demise, the trend for network TV is clear. Television may yet adapt to the challenge. TiVo is working with the industry to solve some of the competitive challenges posed by the Web. Rogers believes that DVRs, in combination with high–definition television, can provide accountability and engagement with customers at a level equal to or better than the Internet. But he suggests that the television industry needs to feel a far greater sense of urgency about the threat posed by fast–forwarding of ads to avert calamity. The networks are not completely asleep. NBC and Fox recently launched a $100 million initiative online, www.–hulu.com, where most of the major network’s prime–time line–ups can be seen for free on the Web. Hulu also made the bold decision to include not only NBC and Fox programming, but also to help Hulu visitors find their way to ABC and CBS shows on the site. In the world of Web television, this makes sense. The more viewers who watch a show, the better for all involved, whether those viewers are watching on blip, Hulu, or other Web sites. To Dina Kaplan’s way of thinking, NBC’s and Fox’s investment is further validation of blip.tv’s model. “Hulu demonstrates that quality shows can thrive on the Web. We are fighting the same battle to convince advertisers and agencies that this is a serious medium. Whether you are the producers of Lost orPolitical Lunch, you are building up a valuable brand name through great episodic content on the Web.” In the end, she says, blip.tv could become the source of independent content for Hulu as well as any other television network efforts on the Web. “If you go to iTunes, which is one of the biggest locations for new independent shows, we will be hosting the vast majority of the podcast directory there,” she says. As the sun begins to drop in the sky over Lafayette Square, Kaplan collapses into a purple beanbag chair in a tiny conference room, just off the fire escape where employees smoke cigarettes and watch Hampton’s traffic in the summertime. She clicks on the remote control for Sony’s newest television set. One minute she has Mad Men on the screen and the next it’s Pilates on Fifth, a blip show sponsored by Puma sneakers. Then she pulls up Who What Wear, a popular fashion show on blip produced by an offshoot of the Hollywood talent agency UTA. To prove that content creators aren’t just MySpace teenagers, she turns to Feed Me Bubbe, a blip show produced by an 80–year–old Jewish grandmother. The point is not just the variety of shows, but that she is watching them on a television. And with the next generation of televisions, like the Sony Bravia, that is just what blip.tv will do. You will be able to see blip.tv on your television screen as easily as you can see NBC. TiVo started the revolution and Kaplan likes to point out that her mission is to facilitate the new generation of content creators who will be enmeshed in that connective tissue. The democracy of the Web, as a result, is not just appealing to new producers but to established ones, too. That’s why Michael Eisner has spent so much time and money on his Web shows, hosted on blip.tv, for instance. 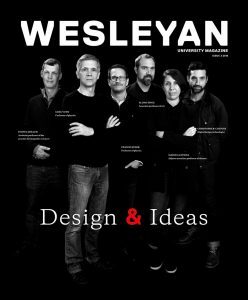 At the end of another 20–hour day, Kaplan reflects on why Wesleyan was actually the perfect training for starting a company, and thereby changing the media landscape forever. “If you want to get something done at Wesleyan, there’s no red tape, you just do it. There are no excuses for not getting it done. The same is true of starting a company.” Before leaving the office, Kaplan receives word that Sarah Austin has decided to move Pop17 to blip.tv. Her partner also calls to confirm that Bain Capital has just become a major investor in the company. Blip.tv isn’t yet the Google of Web TV, but that dream is one day closer to becoming a reality. Tom Matlack ’86 is a freelance writer who most recently wrote about Matthew Weiner ’87, creator of Mad Men, for Wesleyan magazine.